If you keep bees, it’s likely that sooner or later something like this is going to happen to you. Upon visiting your bee yard you find a pile of dead bees on the ground in front of the hive. 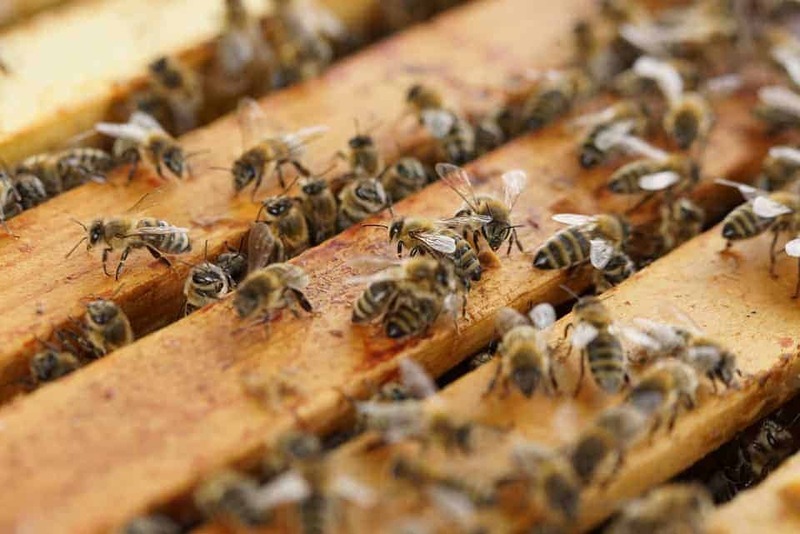 Your first thought might be colony collapse disorder (CCD) but this is not likely the case. In the case of CCD the colony simply disappears, possibly leaving behind some brood, stores of pollen, honey and even the queen. Cases of CCD most often occur late in the year. So, if your bees disappeared then you should first consider the time of year. For example, if you just hived a package of bees in the spring, the bees may decide the new hive is not for them and choose to find a home elsewhere. The same is true if there is a dearth of nectar or water and the bees decide to move on to greener pastures. One more difference between CCD and absconding is that colonies that abscond generally take everything with them. They know they will need those resources to establish a new home and do not leave much in the way of honey and pollen behind. Generally speaking, a well established hive that has been in place for a few years is unlikely to abscond, unless the environment around them changes. In summary, absconding colonies will take just about everything with them and hives left vacant from CCD normally leave stores and even the queen behind. A pile of dead bees outside the hive clearly indicates an event other than CCD or absconding. Mites can cause the loss of a colony, but those bees will normally be found inside the hive on the bottom board. A large pile of bees outside the hive raises the likelihood of poisoning, but how can you tell? If you had been to the bee yard in the last day or two and knew for sure the pile of dead bees was a recent occurrence, then it’s likely someone sprayed a pesticide nearby and the hive was caught in the drifting spray. Or, in situations where they are spraying mosquitoes, such as in the case of the Zika virus recently, it’s a onetime thing. In a situation when you know the day of the spraying in advance, close the hives at night and cover them with a wet sheet or blanket to keep them cool. This contains the bees in the hive during the time of the spraying and provides a measure of protection from the spray. One way to tell if the bees were poisoned is to examine some of the dead bees and see if their proboscis (tongue) is sticking out. Poisoned bees typically exhibit this symptom. The next thing to consider is if the damage is occurring at the individual or hive level. In the example given above, the large pile of bees would indicate it occurred on the colony level from a onetime event. Let’s look at a case study that demonstrates a different kind of experience. The apiary in this example is located on the edge of the city limits. The west side of the property is bordered by a dried-up, abandoned pasture, purchased for a development that has not yet taken place. The other three sides of the property are surrounded by suburban housing. A quarter mile south is irrigated pasture with livestock and a half mile away to the southwest is more irrigated pasture. The beekeeper had not been out to visit his bees for four or five days when he decided to simply go sit in the apiary and observe the hives on a beautiful late September afternoon. What he found was quite disturbing. The apiary contained five hives and in front of each hive were 12 to 15 bees crawling about, unable to fly. Some were quivering, trembling and showing signs of paralysis. Most seemed disoriented and none could fly. There were a small number of dead bees in front of each hive that had not been there the last time the beekeeper visited. Alarmed at what appeared to be poisoning he quickly grabbed his bee suit and headed for the hive with the largest pile of dead bees in front of it in an attempt to determine the extent of the damage. Each frame of bees he lifted from the hive contained a mixture of bee behavior. Most were normal in that they were calm and walking across the frame as expected, but about ten percent of them were quivering, shaking, running about disoriented and displaying jerky erratic behavior. Some were even falling from the frame. Their behavior clearly distinguished them from the “normal” bees. When the dead bees in front of the hive were examined most were found to have died with their tongues sticking out. The behavior of the bees in the hive coupled with the tongues sticking out on the dead made this a clear case of poisoning. 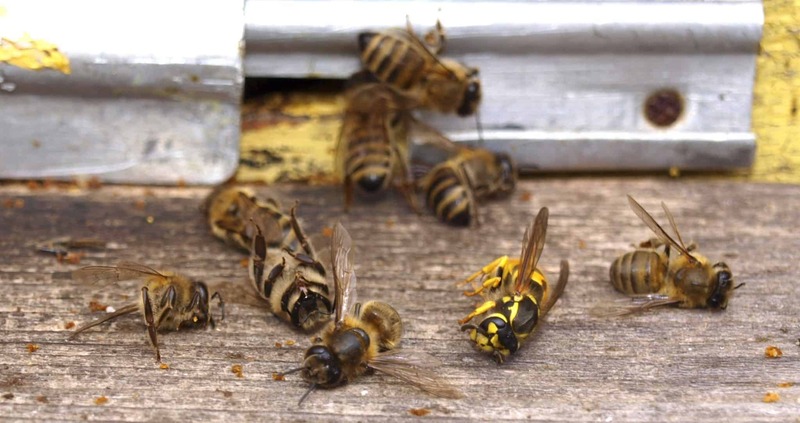 However, instead of one major event resulting in a large number of dead bees typical of poisonous spray drifting into the hives, it seemed more likely the bees were gathering nectar and pollen from a source that had recently been treated. The foragers were getting a sub-lethal dose, one that didn’t kill them immediately. Fall in the Central Oregon High Desert is exceedingly dry and nectar sources are few. The beekeeper had provided a clean water source so a polluted source of water was not likely to be the issue. Another possibility was a poisoned nectar source. Late in the season when nectar resources dwindle, the bees can turn to collecting honeydew. Honeydew is produced when aphid feed on the sap of plants. Often you can observe this situation in the parking lot at a grocery or big box store where the pavement is darkened by the honeydew dripping from the tree. In Central Oregon this can occur on plants such as aspen, fir, maple, poplar, willow and linden trees. For other areas of the country it might be basswood, cedar, ash, sycamore or oak. By fall, some of these plants will be diseased, or the aphid problem will become obvious to the property owner, who then chooses to either spray the aphid or use a systemic insecticide. The systemic insecticide will stay in the plant for an extended period of time and will continue to poison the bees that come to feed on the honeydew and sap being produced by the tree. This situation has the potential to be worse than a single event that poisons numerous foragers at once and then is over. Low doses that don’t kill the foragers allow them to bring the poison home and feed it to the developing larva which can then have developmental impacts. At this point the colony may be in danger. The beekeeper in this story was never able to determine the source of the poison, though the use of a systemic insecticide was suspected due to the extended period of time the bees were exposed. Over the following weeks the bees continued to die although the number of dying bees slowly declined. It also became clear that one hive was feeding on the poison source much greater than the others. To help the colony recover, the beekeeper gave the hive additional wind protection for the winter. He also fed them pollen from a clean source (pollen provides amino acids which the bees require for a healthy diet) and used a boardman feeder to provide a direct source of clean water to the hive. In the end the colony did survive, most likely because it had been a very strong colony with a young queen prior to the poisoning. A weaker colony would likely have perished as the continuous poisoning of larva often sends a colony into a downward spiral. Do You Have These in Your Garage? The events described in the story above took place in a typical suburban neighborhood. There are many chemicals highly toxic to bees commonly used in the backyards of many residential areas and you might want to check to see if you own any of them. Below is a short list. To prevent bee poisoning check to see if you happen to be using any of the chemicals listed above.